Good news! I finally fixed my obnoxious Atari 2600 problems, so now I can game the proverbial school so old, its age actually exceeds the real high school I attended. Released in 1982, the game I’d like to write about today holds the rare distinction of being a video game older than me. That’s right, I’m reviewing Pitfall, in case your eye didn’t immediately wander to the screenshot at the top of this post. Donkey Kong appeared in arcades in 1981, and a year later Activision released Pitfall for Atari systems. People loved these games. They had a simple concept, yet provided enough challenge that many people never saw the end. In this way, Pitfall and Donkey Kong began the scourge of frustration known as the platformer genre, much like two drug dealers who generously shoot a free sample of heroin directly into your veins, giving you the rush of pleasure followed by a decade of dependency, stress, bankruptcy, wasted time, and anger issues while never quite living up to that first dose. 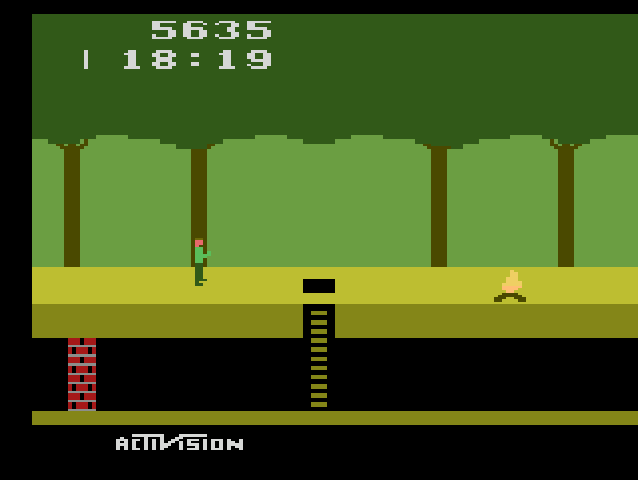 Despite Donkey Kong’s title as arguably the first platformer, Pitfall introduced many of the features we now associate with the genre: side-scrolling levels that take up multiple screens, a number of different enemies and obstacles, the possibility of death by falling into holes, a timer, and a score counter that means absolutely nothing compared to the bragging rights of having actually finished the game. 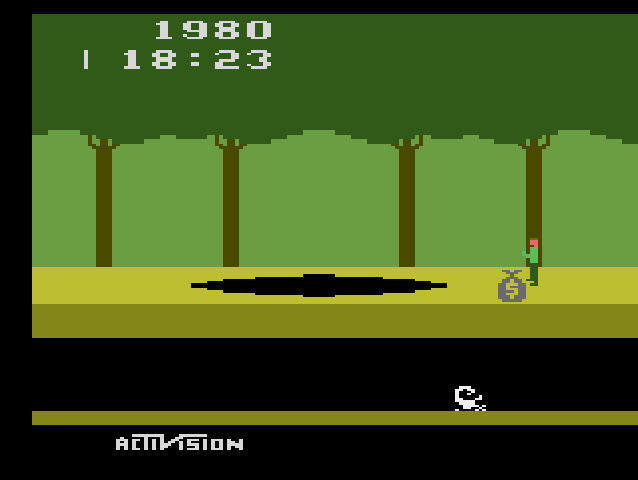 You play as Pitfall Harry, a character with a name unfortunately easy to pervert at an elementary school lunch table. As Harry, you run through a jungle of various assorted dangers including crocodiles, rattlesnakes, scorpions, deep pits, and…uh…campfires? Your goal is to accumulate a vast amount of wealth by picking up treasures just lying around in the wilderness for anyone to take them. The design of the character and the tone of the setting evoke powerful images of…oh, hell with it. 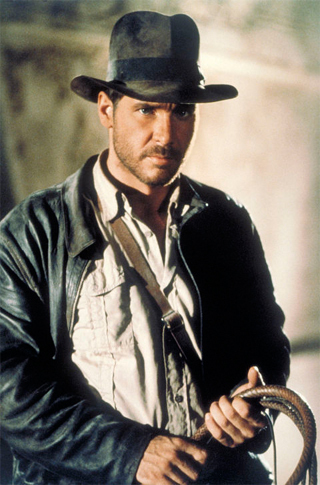 It’s Indiana Jones without the nazis. Game designers in the eighties loved to push the bounds of plagiarism–but in a good way–and they based all the best games off concepts they saw in movies. Doesn’t Donkey Kong climbing up the side of a building with a girl bring anything else to mind? (Just do me a favor and don’t tell me what movie Burger Time came from.) I find this amazing considering that any game licensed and based on a movie today contains less fun than a lump of coal, with slightly lower replay value. But I’ll play this game, and not for the badly pixelated Harrison Ford, either. As much time as I’ve spent comparing them, Pitfall upped the ante for Mario. It gave us other things to do in a game besides dodging barrels. It gave us the concept of attack patterns–yes, you get the rolling logs like the barrels from Donkey Kong, but it also introduces snakes that Harry has to jump over, scorpions that move back and forth, making those jumps more difficult, and crocodiles who periodically open their mouths to swallow you like a gazelle stupid enough to drink from the river. Holes proved fatal, as far as I know for the first time in video game history, and the player had multiple ways to clear them, either by jumping from crocodile to crocodile like a gazelle too stupid to walk around the small, circular pond, swinging from a rope–at which point the game plays an awkward sound that I eventually figured out was supposed to sound like Tarzan, or he could time his dashes across expanding and contracting pits. 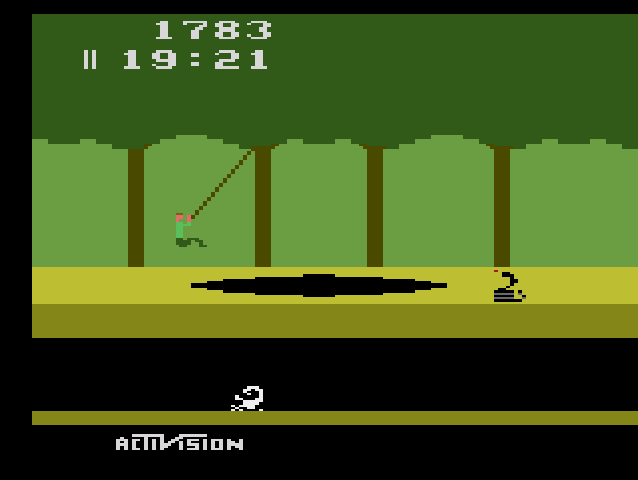 While the historian in me loves the significance of Pitfall, the player in me can’t exactly pinpoint why I tolerate it so well. It remains, by no stretch of the imagination, the first of the modern platformers. It sends me on long, challenging levels fraught with instant deaths, and it erase all my progress at the slightest step into the shallow water and forces me to start over. I can’t say that my limited exposure to this game in my youth makes it new and exciting now–I never played Sega until recently, yet one minute of Sonic the Hedgehog and I’ll break records for how fast I can shut off the game. I’d put my money on the difficulty level. The game pushes you back–you can’t win after only an hour or two of trying. Yet at the same time, the pacing of the enemies and obstacles don’t wear your nerves. You handle one or two problems on a screen. Can you jump to the swinging vine? Okay, now try it with rolling logs. You did that? Great. Now jump over this rattle snake while dodging logs. Different problems combine to make new challenges, but you get to deal with these problems in a reasonable manner. Platform game designers often place too much emphasis on small platforms and large pits, shifting the focus of the entire game to avoiding a plummet to your doom. Pitfall includes that challenge, but in moderation; you can’t cross certain ponds without jumping from croc head to croc head without falling into the water or stepping kindly into their teeth, but this sort of obstacle only shows up every once in a while, and as soon as you’ve proven your skill at not dying, it goes the hell away for a little while! Modern platformers can’t handle the concept that once you’ve gotten the hang of something, demanding that you repeat that skill ad infinitum only produces two outcomes: lynching yourself with the controller cord in anger over making a stupid mistake, dying and being sent back to the beginning of the level, or becoming helplessly bored. 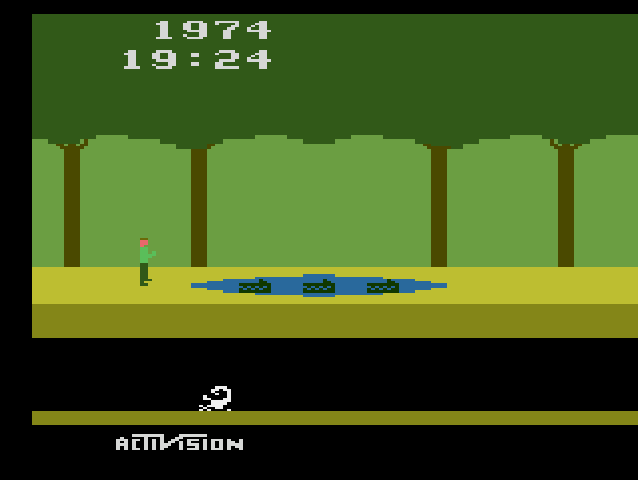 Pitfall definitely piques my historical interests, and certainly shows an example of designers pushing past the bounds of their technology. Granted, the inane infantile nature of the platforming genre doesn’t exactly endear itself to me, so I have to admit I doubt I’ll form fond memories of playing Pitfall until I wet myself because I can’t pry myself away from it long enough to use the toilet, I will break down and say I don’t suffer quite enough while playing it that I’d never go back to it. I could definitely find worse things to do while I’m waiting for a pizza to arrive. This entry was posted in Atari, Pitfall and tagged Atari 2600, Pitfall. Bookmark the permalink.